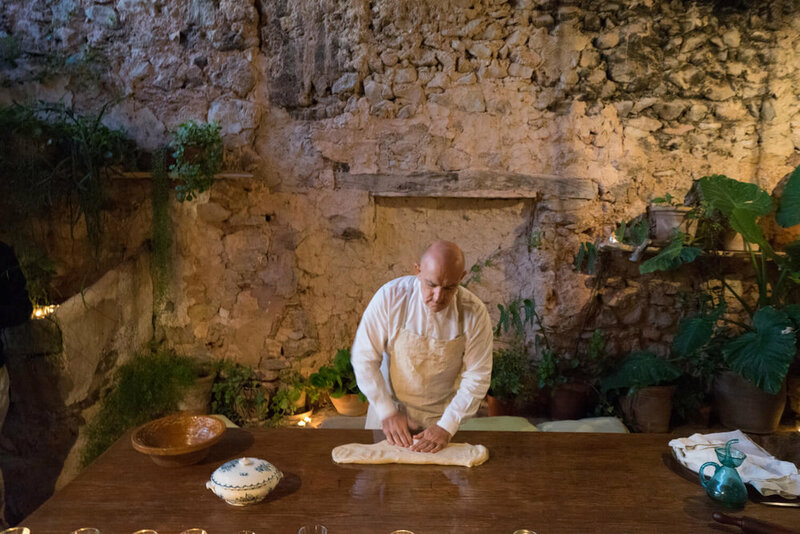 They consist of forgotten documents, notes that never were published, and other additions, and they help him create his version of Mallorca’s culinary heritage. He calls himself a 'gastronomical archeologist', and undertakes his mission with great responsibility and commitment. The results inspire his customers' memories through their taste buds, their connection to their past, and their childhood experiences with food. He makes everything from cocas, empanadas and other old fashioned savories, to sweet concoctions and recipes that are made on specific dates only and which follow the island’s festivity calendar. The evening I meet Tomeu, I am excited to get to know this living legend, after days browsing through his book, Traditional Cooking in Mallorca. The recipe book is more like an encyclopedia, and is as heavy as one too! It is filled with incredible mouthwatering recipes. When Tomeu comes into the room, his aura almost consumes the space. He is gentle and sweet, and one can tell that his passion leads his life. His wife, Maria José, is as involved as he is, and the duo make the evening so special for us. Maria Jose and Tomeu are here to cook for us, and Deborah feel so honored tonight. 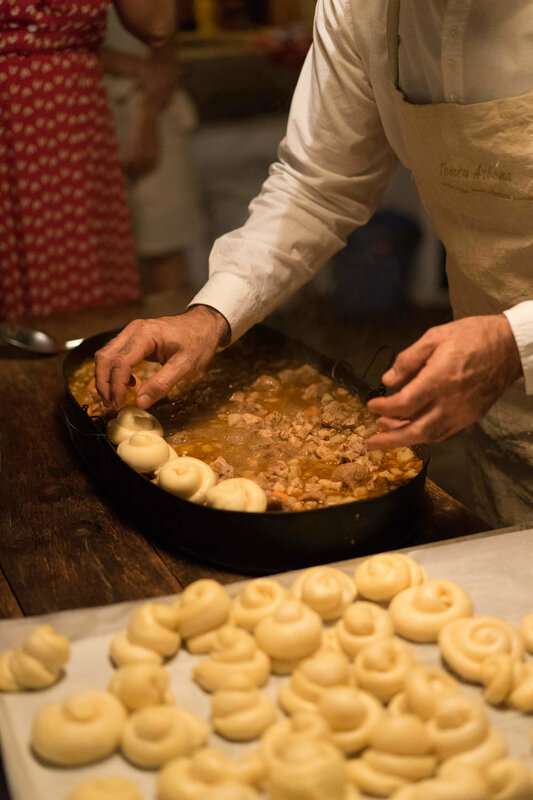 They make a traditional dish, which includes turkey stew topped with hand-made ensaimadas, and finished in the wood oven. I could not imagine what was about to happen. Tomeu starts singing an old baker's song, as his hands begin to spread the flour on the wooden table. The emotion and surprise is similar to what ones feel while watching flamenco or art interpreted with a similar passion. Guests are enjoying the sight, the sound, the smells, and then the tastes that night. 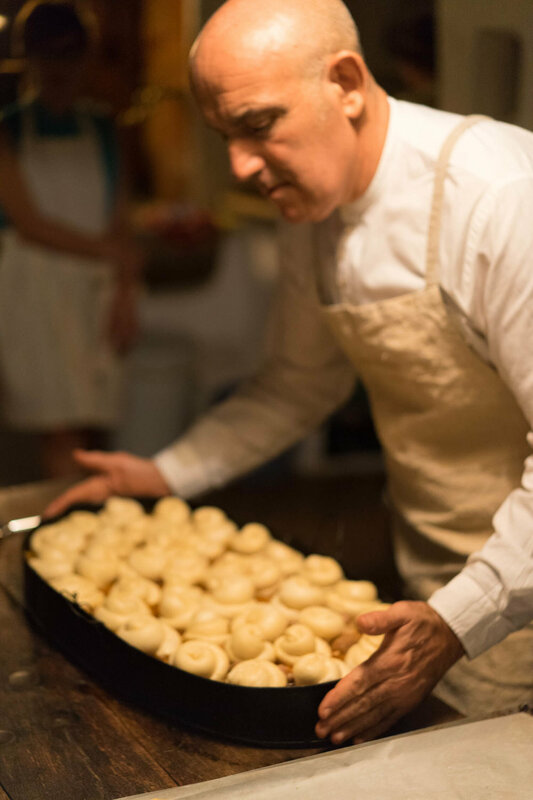 He gently makes the ensaimadas, rolling the dough lengthwise, intertwining the different parts like a weaver, or a dedicated artisan. What we just watched tops any cooking show I have ever witnessed; surely nothing as soulful as this can be experienced in a simple bakery or kitchen.